The role of the Sober Companion has evolved dramatically over the last few years - and we believe it will continue to grow and change. Unlike the Sober Coach, who usually sees clients for therapeutic sessions lasting no more than 2 hours at a time, the Sober Companion will spend incredible amounts of time with his or her client. This can involve full work days, full work nights, or extended periods where the Sober Companion is by your side 24 hours a day. Some clients like to think of the Sober Companion as a real go-to person - and we will do anything in our power to help you maintain your abstinence from drugs & alcohol. The Sober Companion helps build client confidence by helping the client experience himself or herself in situations which would previously have led to relapse. Explore, in depth, those areas where the client has little or no experience in "saying no". The Sober Companion will help the client identify areas which have presented or may present roadblocks to continued abstinence. A Sober Companion will transport a client to and from every location throughout the day. Ensuring that the environment is drug-free for the client is one key element of the Sober Companion role - this inlcudess hotel rooms, executive offices, studio sets or trailers, residences (house or apartment), personal vehicle, etc. A Sober Companion will provide services to those leaving treatment, currently in sober living, in an outpatient/day-patient program, in their own home, transitioning from sober living or treatment to their own home, or who suffered a recently relapse. It is important to remember to differentiate between the role of the Sober Coach and the Sober Companion. Sometimes, a client will start with one and need to transition to the other. Whatever your needs, Sober Champion has the staff and experience to help you achieve your goals - free of drugs and alcohol. When a client is deciding what to do next with his/her life, anxiety and fear can be debilitating without the right support in place. Staying away from getting loaded can be a lot harder than one might anticipate. Peace of mind, fun and happiness are hard to achieve in recovery without the necessary life skills. 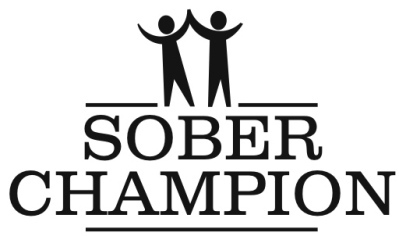 A Sober Companion challenges and supports his client to make lifestyle changes and experience a better quality of life. We want our clients to avoid relapse and end the cycle of multiple trips to treatment. We can help our clients be more effective, stay serene, and get “back to center”. You can hire a Sober Companion or a Sober Coach right away.